This is a comprehensive but uncomplicated business premises lease for letting self contained office or storage space above a shop or other workspace. There is no provision for shared services or service charge recovery. Features: guarantor provision; break provision; rent review options; options for assignment; no sub-letting; no management or service charge. 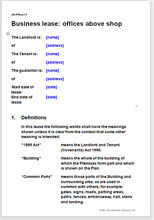 This is a comprehensive but uncomplicated business premises lease for a separate letting of office or storage space above a shop or other workspace. This short term lease should be used for letting offices or other rooms above a shop or other commercial premises. There is no provision for service charge recovery. If there is only one tenant in the whole building, you should use Self contained office lease agreement. This business premises lease is comprehensive, providing alternative choices for important decisions.